Mauritian prime minister Navin Ramgoolam said the sooner that Garda and PSNI officers came to assist in investigating Michaela McAreavey's death, the better. THE PRIME MINISTER of Mauritius says he has invited officers from An Garda Síochána and the Police Service of Northern Ireland to assist local detectives investigating the death of Michaela McAreavey. Dr Navin Ramgoolam said today he would this evening write to members of both forces, inviting them to travel to the island to assist local law enforcement agencies in seeking to trace McAreavey’s killers. 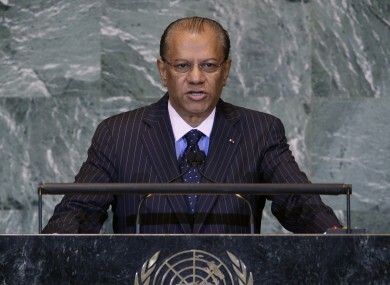 “I will be very, very happy to have them come to assist us,” Ramgoolam said in an interview with BBC Radio Ulster’s ‘Evening Extra’ programme. Ramgoolam added that the publication of photographs showing McAreavey’s body in the immediate aftermath of her death was “outrageous” and revealed that police had made a second visit to the premises of the Sunday Times, the paper which published them, this morning. The journalist responsible for the photographs had been interviewed by police, who had also collected material from the newspaper’s offices, he said. Today the editor of the Sunday Times, Imran Hosany, offered an apology to the McAreavey and Harte families over the publication of the pictures, saying he had done so in order to draw attention to the fact that the crime had remained unpunished. The families rejected the apology, however, saying the newspaper had “made a calculated decision to use photographs and images that no responsible media outlet would have touched”. A spokesperson for the families said the most obvious way for the newspaper to co-operate with police investigating Michaela’s death was to inform them how it had obtained the photographs it published. Michaela, the daughter of Tyrone football boss Mickey Harte and a former entrant in the Rose of Tralee, was found dead in her hotel room at the Legends Hotel while on honeymoon with her husband John, who she had married just a fortnight previously. Post-mortems indicated the newlywed schoolteacher had been strangled. Two men accused of murdering her were acquitted last week following an eight-week trial which gripped the island. Email “Michaela death: Mauritius PM invites Gardaí, PSNI to investigate”. Feedback on “Michaela death: Mauritius PM invites Gardaí, PSNI to investigate”.